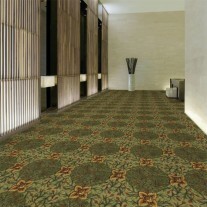 Commercial Patterned Print Carpet...bold and beautiful! 100% advanced performance continuous filament nylon with Gx3 stain protection with a 25 year wear warranty. 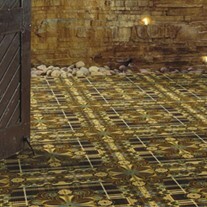 This product is manufactured specifically for use in all your high traffic areas. This is sure to be an instant classic! Noble coordinates with many of our other styles, but will definitely add gorgeous print and beautiful elegance all on it's own! Noble is perfect for that bold, yet elegant modern look. Excellent for all public spaces, hotels, offices, and churches! Also excellent for binding to make a perfect room sized rug. Choose Noble when you want bold elegance in a carpet designed to maintain a fresh, updated look for years to come. Promo price posted is for full rolls or more, Any size can be purchased, and if less than roll call for pricing. Worried about shipping costs? Don't be! We are happy to say that customers are pleasantly surprised at the low shipping costs! We have special rates from the freight carriers, and we pass that savings on to you. And think about it, your carpet has to be shipped, no matter where you purchase, and those shipping costs are simply built in to the high retail pricing. So pick your product and amount, give us a call, and let us get you an exact price for your freight.